Mr. Anil Rana started his career as an English teacher at a university, where he worked for about a decade. Calling himself a “restless visionary” he resigned from his job in1998 and established the Janhit Foundation in Meerut. Beside information dissemination and creating awareness he also takes vital environmental issues – especially to do with water – into campaigns and to the juridical level. In the last five years Mr. Rana has filed eight public interest litigations on violations of human rights at Indian courts. He is a good communicator and makes sure that the foundation’s activities get broad publicity, an integral part of his public pressure building. The Janhit Foundation is an independent non-profit and non-governmental organization, which engages in the promotion of human welfare through environmental protection. Among the key areas of work are all issues about water quality like safe drinking water, protection of rivers and lakes and aquatic eco-systems, rooftop rainwater collection in urban areas and development of organic farming methods. At the moment the foundation works with about 400 farmers and is about to expand the programme by another hundred. The converted farmers practise biodiversity by replacing the quasi monoculture sugar cane and wheat rotation with the cultivation of pulses, fruits, other cereals, flowers, medicinal and herbal plants and for example bee keeping. 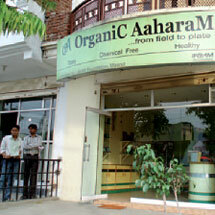 Janhit Foundation also helps the farmers with marketing and has just recently opened the first organic shop in Meerut. All employees are engaged in the medicinal herb gardens in schools and biodiversity parks in villages. The foundation also runs a nationwide children’s telephone hotline, where they not only take calls and listen to children’s problems, but take immediate steps and help find solutions. The staff of the foundation is itself engaged in charity work. It has built and runs schools in two slums, where helpers reach out to about 100 children who are school drop outs. They also organize regular health camps and opened a soup kitchen in the slums to provide a daily meal to the children. The Janhit Foundation works on all three pillars of sustainability, yet keeps a focus on environmental protection in its widest sense.